Tracing Information Society – A Technopolitics Timeline traces the evolution of the information society. 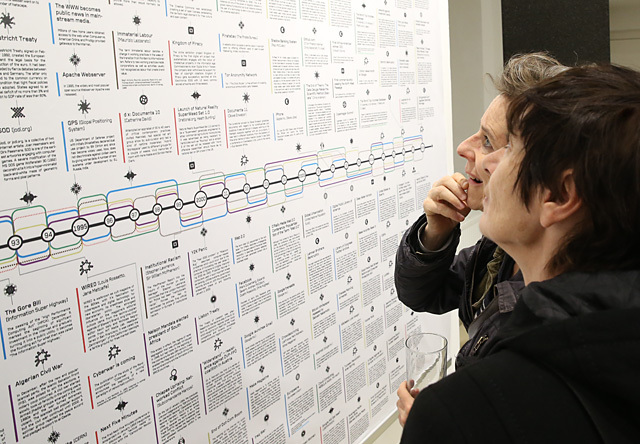 The Technopolitics working group conceives the timeline as an artistic medium for visually addressing complex historical relationships and breaks and drawing attention to the different genealogies of information society. Participants: John Barker, Sylvia Eckermann, Doron Goldfarb, Armin Medosch, Gerald Nestler, Felix Stalder, Axel Stockburger, Thomas Taler, Matthias Tarasiewicz, and Ina Zwerger. Graphic design: Fatih Aydogdu. Technopolitics describes the attempt to develop a theoretical framework that facilitates an understanding of complex and multilayered historical developments and their interplay. Initially founded by Brian Holmes and Armin Medosch in 2009, a Technopolitics research group has been active in Vienna since 2011, which regularly organizes talks and discussion events.